This page was printed from http://www.crosleycompany.com/. Visit www.crosleycompany.com for more information. "Gale’s model provided an excellent roadmap upon which to expand our growth-focused culture. She helped us create new approaches, including building niches and developing a robust opportunity pipeline process. Our partner group is growing together with a one-firm concept. Gale’s approach has been an invaluable investment for the firm." Using a disciplined approach enables you to discover your best strategies for long-term growth, as well as focus on short-term tactical opportunities. 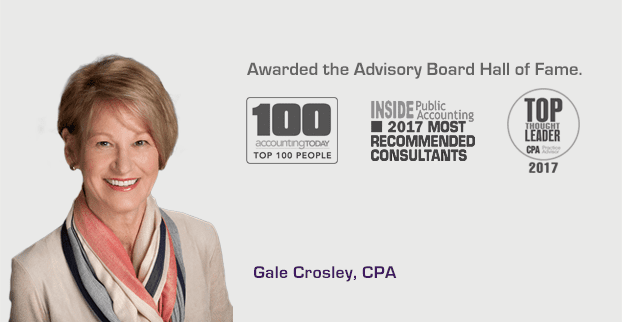 By committed application of generally accepted growth principles, your firm can become the accounting firm you’ve always envisioned.